A lake condo accommodation at Thousand Hills Golf Resort gives every guest a chance to enjoy a wonderful vacation in the Ozarks. 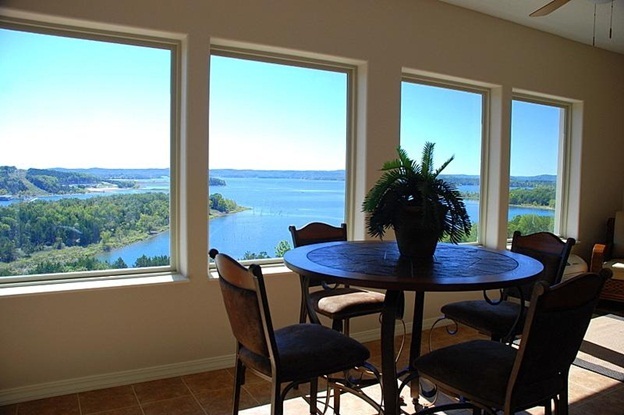 Families who are staying in a comfy lake condo can experience a relaxing day while enjoying the spectacular view of the Table Rock Lake through the open windows. Although the setting of the lake condos of Thousand Hills is in a secluded area, it is actually located in the heart of Branson where world-class entertainment shows, exciting attractions, and shopping are all in one place. The beautiful location of lake condo near Table Rock Dam, Moonshine Beach and State Park Marina gives visitors a chance to enjoy non-stop fun activities. Your stay in the beautiful lake condo gives you the opportunity to experience a luxurious and comfortable living that cannot be enjoyed in a regular hotel accommodation. Each bedroom of lake condo is equipped with king size bed with modern furnishings of triple sheet beddings and top quality pillows to make you sleep soundly the whole night. It is also provided with free Wi-Fi internet access, cable TV with HBO, and a DVD player. When you stay longer in a comfy condo accommodation, you will find it an unforgettable vacation experience because of the offerings of great amenities that you enjoy. The living area of the cozy lake condo accommodation at Thousand Hills features a sofa sleeper that allows extra guest to enjoy a comfortable stay. The kitchen of each condo is fully furnished with modern appliances such as fridge, microwave oven, washer/dryer, toaster, dishwashers, pots and pans, and kitchen wares and utensils. With the complete amenities in the kitchen, you won’t become hungry as you always have the chance to cook your own food. One of the advantages of staying in a lake condo is the opportunity to enjoy the spectacular beauty of nature along the foothills of the Ozark mountains. The convenient location of lake condo in Branson gives you the chance to enjoy tons of exciting outdoor fun activities in the clean and crystal clear waters of Table Rock Lake. With the beautiful setting of the lake near your accommodation, you can always have easy access to some water sports activities offered in the lake such as boating, fishing, or swimming. If you want to enjoy the utmost fun around Table Rock Lake, rent a boat at State Park Marina for a great fishing or boating adventure on the lake. Some of the guests enjoying a wonderful vacation in Branson don’t miss to include shopping and fine dining in their itineraries. All these can be enjoyed in Branson as the place is home to several shopping malls. If you want to shop around Branson, don’t miss to stop first at Branson Landing as this shopping paradise features countless outlet shops and fine restaurants. So, if you want to spend a wonderful vacation with your family this season, stay in a comfy lake condo accommodation at Thousand Hills Golf Resort in Branson.